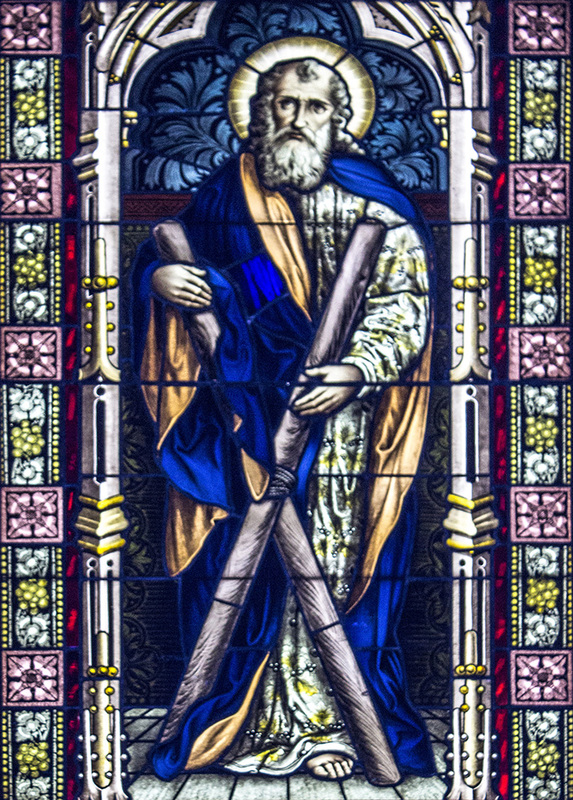 St. Andrew, also known as Andrew the Apostle, was a Christian Apostle and the older brother to St. Peter. According to the New Testament, Andrew was born in the village of Bethsaida on the Sea of Galilee during the early first century. Much like his younger brother, Simon Peter, Andrew was also a fisherman. Andrew's very name means strong and he was known for having good social skills. In the Gospel of Matthew, it is said Jesus was walking along the shore of the Sea of Galilee and saw Andrew and Simon Peter fishing. It is then he asked the two to become disciples and "fishers of men." In the Gospel of Luke, Andrew is not initially named. It describes Jesus using a boat, believed to be solely Simon's, to preach to the multitudes and catch a large amount of fish on a night that originally was dry. Later, in Luke 5:7, it mentions Simon was not the only fisherman on the boat, but it is not until Luke 6:14 that there is talk of Andrew being Simon Peter's brother. However, the Gospel of John tells a separate story, stating Andrew was a disciple of John the Baptist. When Jesus walked by one day, John the Baptist stated, "Behold, the Lamb of God!" It is then that Andrew and another made the decision to follow Jesus. Little else is said about Andrew in the Gospels, but it is believed Andrew was one of the closer disciples to Jesus. It was he who told Jesus about the boy with the loaves and fishes, according to John 6:8. When Philip wanted to speak to Jesus about Greeks seeking him, he spoke to Andrew first. Andrew was also present at the last supper. Per Christian tradition, Andrew went on to preach the Good News around the shores of the Black Sea and throughout what is now Greece and Turkey. Andrew was martyred by crucifixion in Patras. He was bound, rather than nailed, to a cross, as is described in the Acts of Andrew. He was crucified on a cross form known as "crux decussata," which is an X-shaped cross or a "saltire." Today this is commonly referred to as "St. Andrew's Cross." It is believed Andrew requested to be crucified this way, because he deemed himself "unworthy to be crucified on the same type of cross as Jesus." Andrew's remains were originally preserved at Patras. However, some believe St. Regulus, who was a monk at Patras, received a vision telling him to hide some of Andrew's bones. Shortly after Regulus' dream, many of Andrew's relics were transferred to Constantinople by order of Roman emperor Constantius II around 357. Regulus later received orders in a second dream telling him to take the bones "to the ends of the earth." He was to build a shrine for them wherever he shipwrecked. He landed on the coat of Fife, Scotland. In September 1964, Pope Paul VI had all of St. Andrew's relics that ended up in Vatican City sent back to Patras. Now, many of Andrew's relics and the cross on which he was martyred are kept in the Church of St. Andrew in Patras. St. Andrew is venerated in Georgia as the first preacher of Christianity in that territory and in Cyprus for having struck the rocks creating a gush of healing waters upon landing on the shore. His saltire cross is featured on the flag of Scotland and is represented in much of his iconography. He is commonly portrayed as an old man with long white hair and a beard, often holding the Gospel book or a scroll. St. Andrew is the patron saint of fishermen and singers. He is also the patron saint to several countries and cities including: Scotland, Romania, Russia, Ukraine and Patras and his feast day is celebrated on November 30.